Scania is an international manufacturer of commercial vehicles and engines. The company is based out of Sweden, operates in over 100 countries and employs approximately 38,600 employees worldwide. The automotive and commercial vehicle industries face many challenges when bringing a new product to market. With today's CO2 emission regulations and the customers' requests for more efficient vehicles, the industry drives to create lighter and more efficient, yet safe products. There is also very high competition and high pricing pressure on this market. This forces development teams to speed up their development process to achieve a shorter time to market. For Scania, many of these challenges prompted the team to reevaluate their current process. After having moved from traditional, physical testing of prototypes to virtual testing, the company found that too many iteration loops between design and engineering departments were needed. This prompted Scania to implement a simulation driven design process where designers take more responsibility over the design work. Scania accomplished this by implementing upfront simulation and optimization with Inspire. Inspire is a very useful tool when it comes to frontloading simulation and optimization into the design process. The idea behind the process change is that the designer can start with Inspire as soon as he/she has determined the design challenge. It helps answer questions such as: Where should I put the material? How should the structure look to withstand the operating loads? To answer these questions Inspire is now brought into play before the design work in the CAD environment starts. The process begins with Scania’s designers defining a design space, applying loads and other known boundary conditions and then running an optimization. The ideal structural shapes generated by Inspire are then transferred into their CAD system, in Scania's case into Catia, to refine the geometry and to run a first structural analysis to check that stresses, deformation and all other parameters are within the given specifications. Speed up the design and development processes to produce lighter yet structurally and functionally efficient component designs. A simulation driven design process using Inspire within the development chain. Prior to using Inspire, the compliance check of the stress criteria was the responsibility of CAE engineers only, because the designer did not have the right tools. Scania’s new directive allows the designer to also handle structural tasks within their CAD tool, i.e. by using Catia analysis. 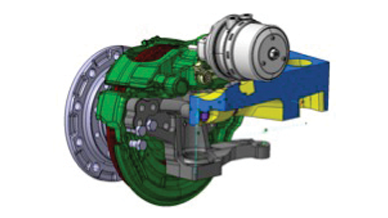 A recent example of Scania’s new process involved the redesign of a steering arm. In this case, the designer first defined the design space of the new component in Inspire and applied the loads and boundary conditions he had received from the CAE department. This enabled the designer to use Inspire to create multiple design proposals. 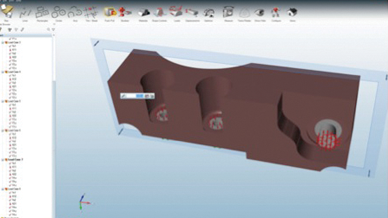 These proposals were then refined and analyzed in Catia. A final design was handed over to a CAE engineer for verification. The design fulfilled the criteria and tooling for production was ordered based on the simulation results. Since the steering arm is a safety article, physical testing was mandatory. The new design passed all required tests. 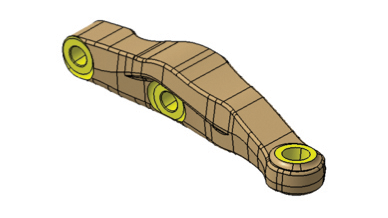 The selected new design reduced the part’s mass by 30% and allowed the team to significantly reduce its development time. Part of the success of the project was the close relationship between the designer, CAE, and testing which were enabled by the application of simulation early in the design process. 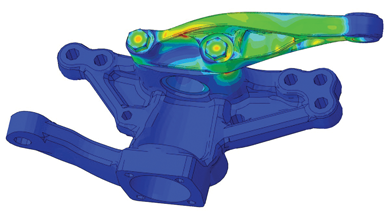 By deploying an optimization tool (Inspire) and simulation into the design process designers no longer have to wait for the CAE or test engineer’s evaluation of their design. This reduces iteration time between different departments. Now a design from the design department only has to undergo a final verification since the designer already has made sure that the design meets weight and stiffness criteria, leading to a lean and more efficient development process. The input criteria such as loads and other boundary condition still come from the CAE engineer, who answers those questions on a day to day basis during his work. The CAE engineer also verifies if the design really meets all criteria before the component is built and also physically tested. Prior to the use of Inspire, the CAE and testing engineers led the process, now the design engineer owns it and helps to create the simulation driven design process philosophy. With its new process in place, Scania is already seeing that fewer iteration cycles between the CAE and the design departments are needed to come to a final design. Key to the success of this process is the way software such as Inspire is used successfully. "If you want to lose weight, it's not enough to buy new running shoes, you need to get out jogging also. It is the same thing here: we do not only have to buy some Inspire licenses to get the process started, but we also have to use the software in an efficient way. Once that is secured you'll receive all the benefits of a simulation driven design process," said Mikael Thellner. These benefits are a leaner development process, lighter and stiffer components, and a closer collaboration between designer, CAE and testing engineer, all leading to significant savings in development time, costs, and the creation of better products. Scania is a global company with a sales and service organization in more than 100 countries. The company develops commercial vehicles as well as engine solutions. Scania’s production units are located in Europe and Latin America. Scania has approximately 38,600 employees. Of these, some 16,000 work with sales and services in Scania’s own subsidiaries worldwide. About 12,400 people work at production units in seven countries and regional product centers in six emerging markets. Scania’s Head Office is located in Södertälje, Sweden, where a total of 5,800 people work with sales as well as administrative and other tasks. Also in Södertälje are Scania’s research and development operations, with about 3,300 employees.